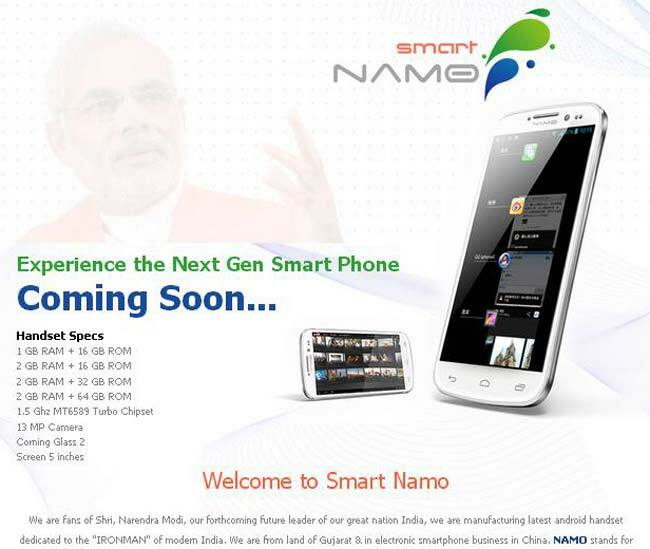 A China based handset company, SmartNaMo(Next generation Android Mobile Odyssey), started by a group Guajarati businessmen, will be launching a smartphone in honour of Narenmdra Modi, the chief minister of Gujarat, by August end. Sources in the SmartNaMo said to The Mobile Indian, "SmartNaMo is giving finishing touches to a smartphone which will be launched in order to show appreciation to Narendra Modi for the work he has done in Gujarat." Sources further added, "In the next couple of week SmartNaMo team will present the smartphone to Narendra Modi and request him to grant permission to use his signature in all the NaMo branded smartphone." The smartphone, according to our sources, will be the first Android based handset of NaMo and will come with a 5 inch IPS panel display with full HD (1920x 1080) pixels) resolution. The display also comes with Gorilla Glass 2 coating that would provide it protection from scratches. Besides, it will have a 1.2 GHz quad-core processor, 2 GB RAM and 32 GB inbuilt memory. The smartphone also supports a micro SD card of up to 32 GB.